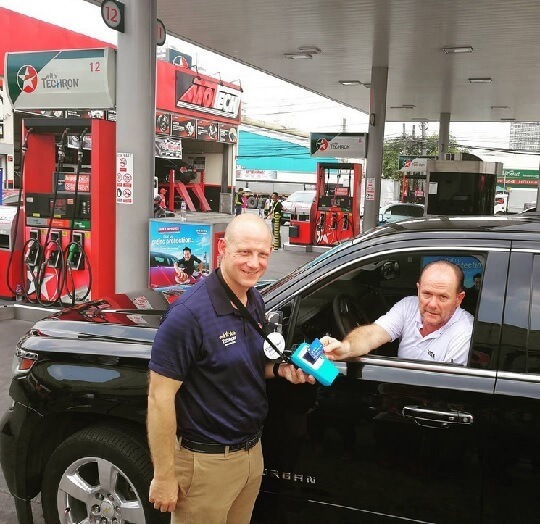 Caltex, one of the "Big Three" oil player in the country under the wings of Chevron Philippines, Inc. (CPI), introduces a more convenient way to gas-up that will surely enhance the experience of customers visiting their stations. Starting today, they will be implementing contactless payment system through Visa' payWave technology. Visa-cardholder motorists who will fill-up their gas tanks at Caltex stations do not need to swipe their cards nor sign or enter their pin to pay. Instead, all they have to do is wave their Visa cards in front of the payWave readers. This new payment option pretty fast, convenient, not to mention more secured, as you do not need to hand out your card to anyone. However, there is a catch, gas purchases must be 2000 pesos or below, otherwise, Visa cardholders will have to sign the transaction slip or enter the pin to the terminal. As part of the newly forged partnership, Caltex and Visa announced the "Drive Away a Millionaire" promo, wherein motorists will get a chance to win Php1,000,000 worth of Visa card credit or one-year Caltex fuel supply worth Php100,000 in the form of StarCash. Each Caltex fuel-up using Visa payWave cards entitles up to 3 raffle entries for every Php500 increment, while the traditional Visa contact transaction is equivalent to one entry.